December 22 turned out to be a night the galaxy opened its doors to us, showcasing the stars of today and tomorrow in the Lux Anandadhara Photogenic 2004 Contest. The floors of Sonargaon's Ballroom echoed with roars as the twelve finalists of the competition from all over Bangladesh took to the stage, all ready and eager to be crowned the next Miss Lux Anandadhara Photogenic 2004. The stars were not only the contestants themselves, but the panel of judges as well which included a host of celebrities that would send a 'big-bang' in the universe starting off with Syed Shamsul Haque, Alamgir, Anisul Haque, Subarna Mustafa. Zahid Hassan, Afsana Mimi, Sara Zaker, Kanak Champa Chakma and Aupi Karim. The show was anchored by Faisal and Brownya, who guided the contestants, the judges and the audience through the show, highlighting the life and ambitions of the young budding models. Tapan Chowdhury and Shakila Zafar gave a stunning performance of Mon shudhu mon chuyeche followed by Ayub Bacchu and Shubir Nandi, who teamed up to follow the theme of Shopno, a trance-techno-classical fusion, backed by percussions, tabla and drums. The outcome: a creation unlike any other, that had the audience transfixed with delight. The contestants showed off their beauty and eloquence as the judges bombarded them with questions and they all managed prompt answers. Finally, Runa Laila took to the stage to announce the winners. 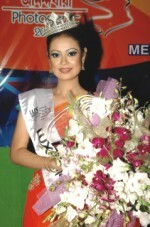 The second runner up of the contest was Dhaka's Sumaya, the first runner up was Rajshahi's Tanzika and the Miss Lux Anandadhara Photogenic 2004 was Kazi Farhina Islam from Chittagong. Unilever Bangladesh Ltd. organised this glamorous event that introduced us to the stars of tomorrow.